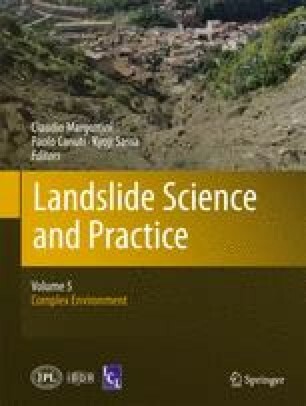 Analysis of distribution of landslides (rock falls and coherent slides), induced by 12 moderate to strong earthquakes occurred in the last three centuries in Central–Southern Apennines, has permitted to investigate the relationship of their maximum distance versus magnitude and ESI epicentral intensity. For coherent slides, the correlation of magnitude or ESI intensity versus distance is fairly good and consistent with global datasets. Instead, rock falls show a less evident correlation with distance. We stress here the usefulness of such relationships to define the expected scenario of earthquake-induced landslides. However, the data base needs to be improved and enlarged to allow more robust estimates. D’Agostino, N., A. Avallone, D. Cheloni, E. D’Anastasio, S. Mantenuto, and G. Selvaggi (2008). Active tectonics of the Adriatic region from GPS and earthquake slip vectors, J. Geophys. Res. 113, no. B12413, doi 10.1029/2008JB005860.